Perhaps your ultrasonic welder has been running the same application for months, maybe years, with no problems. Abruptly, this cheery continuity is disrupted. 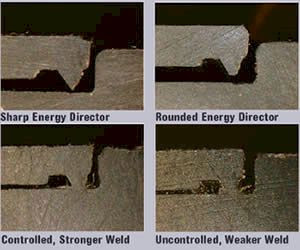 Has your weld strength decreased? Are you seeing excessive flash? Does your welder overload as soon as the cycle starts? Here, we will discuss a few unseen factors that can cause sudden changes in your ultrasonic weld quality and how to prevent and correct them. Ultrasonic welding works by applying a vibration at a frequency of 15 to 70 kHz to a plastic part. This vibration is generated through the use of piezoelectric ceramics in the transducer, that convert an electrical signal into mechanical motion. The transducer creates a vertical vibration that is then translated through the booster, and subsequently, the ultrasonic horn. The ultrasonic horn is typically designed to contact the part directly above the weld area so that the vibrations can travel though the upper part to the weld area. It is important to prevent metal-to-metal contact on your ultrasonic horn to increase its longevity. Because the horn is a tool with acoustical properties, users should be careful to preserve its structural integrity. Any nicks or gouges in the surface of the horn act as stress concentrators that can rapidly lead to cracks when the horn is in use. Many signs can indicate a change in your ultrasonic welding process. Some indications of a problem with your part include decreased weld strength, increased flash, and the appearance of cosmetic damage. Some things that signify a problem with the welder or ultrasonic horn are an increased wattage draw, a change in the sound of your weld (typically apparent on lower-frequency welders), and overloading. There are many not-so obvious factors that can negatively impact your ultrasonic weld quality. One of the most frequent causes of problems in a long-running process is wear on the mold that produces the parts to be joined. This is a slow, but sure, event in any molding process. Because most joint designs are relatively small compared with the size of the overall part, changes in their size or shape may go largely unnoticed. For many applications, a change in shear width from 0.016 in. to 0.020 in. can make a huge difference in weld quality. Such changes can be caused by just 0.002 in. of mold wear on each part. Probably one of the most overlooked factors contributing to ultrasonic welding problems is changes in the time from molding the part to welding the part. Proper ultrasonic welding setup can be drastically different when welding “cold” parts as opposed to welding “hot” parts. It is generally not a good idea to weld “cold” parts to “hot” parts.